Credits: Clockwise, from left to right: Bouquet photo by Our Labor of Love via Ruffled, LOVE photo by Kareem Black, Bride photo by Tanja Lippert via Style Me Pretty, Ring photo by 3photographers via Brooklyn Bride, Hot pink lipstick via A Glamorous Little Side Project, Hot Pink gown by Katie Ermilio via Simply Seductive, Mini cake photo by Chloe Murdoch with Mike Larson Photography Inc. via Style Me Pretty. 1. Kate Spade Vonya, $225.00; 2. Passion Triple Flower Earrings from Phoenix Art Studio, $30.00; 3. Stawberry Milkshake Poms from pomtree, $13.00; 4. Topshop Lip Stick in Rosa, $14.00; 5. Pop Flower from ban.do, $75; 6. Clutch from Cory Renee, $75.00; 7. Romantic Ring Bearer Pillow from Romancing Juliet, $36.50. This is just gorgeous! Great ideas to use. Thanks for the post. I really appreciate it!! Just started planning and love the hot pink with white. Stunning. 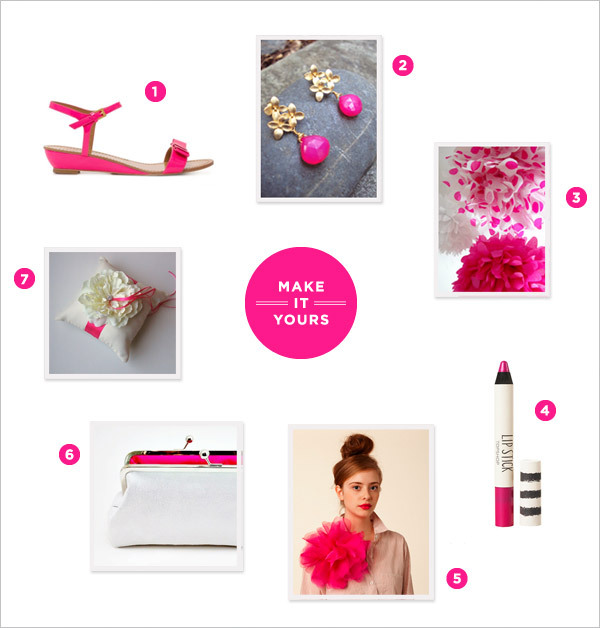 Hot pink peonies are my favorite (next to pink peonies) for weddings! 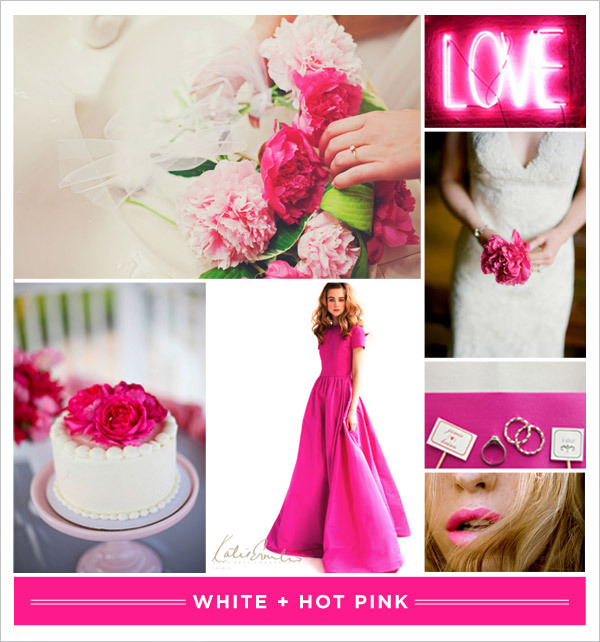 I love it when wedding flowers are made with hot pink flowers…adds lots of zest to the event! The pink is just stunning! What a great way to stand out during your wedding! 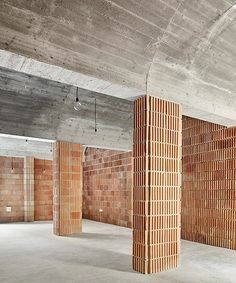 What a great color inspiration!